Bernard 'Bernie' Carter, 72, passed away unexpectedly Saturday, February 2nd, 2019 at his home in Sheppton. Bernie was born in Chester, on December 18, 1946, a son of the late Elizabeth C. (Drumheller) and Bernard D. Carter. He ws the co-owner of the local gas company Valley Propane in Hazle Township. 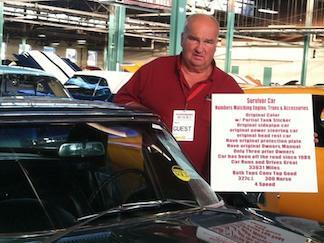 Bernie was also a classic car collector and enthusiast who enjoyed attending auto auctions, car cruises and car shows, especially the Bloomsburg Nationals. He was a kind man who was generous to those in need. He was preceded in death by a daughter, Christy Sue in 1981. Bernie is survived by his wife of 37 years, Susan (Foose) Carter. He is also survived by a son, Bernie Jr., and his wife Jacqueline , of Catawissa; a sister, Carol Carter and her fiancee Bob Briggs of Sheppton; and a brother Jerry Carter, of Phinneyville. Relatives and friends are invited to attend a funeral service which will be held 8 PM on Thursday, February 7th 2018 at the Stauffer-Breznik Funeral Home, 412 West Main Street in Ringtown. A viewing will be held from 5 PM to 8 PM on Thursday evening prior to the service at the funeral home. In lieu of flowers, Bernie's family asks that memorial donations be made to either the American Cancer Society, or St. John's Lutheran Church in Brandonville in his memory.